We sell both pure copper and bronze copper wire! 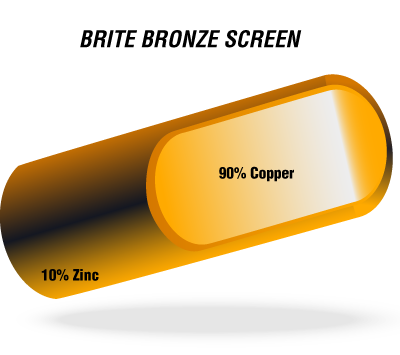 Metro Screenworks’ copper screen is made of 90 percent copper and 10 percent zinc to provide strength and durability. Our copper screen is also known as bronze screen because it weathers to a beautiful dark bronze finish. We also offer pure copper screen which is 99.9 percent copper and is a 16 x 16 mesh count. Our copper or bronze window screen material is available in a variety of roll lengths and widths. Copper insect screen is ideal for use in coastal areas or inland areas: Copper insect screen provides protection from insects and looks elegant, too. Copper screen can be installed in window screens, sliding screen doors, screened-in porches and enclosures. Buy copper or bronze screening today and we will ship to you promptly! Have Questions About Your Custom Screen? Not sure what size of custom screen you need? Read more about measuring for your custom screen or replacement window screen frame here! For all other questions about your custom screens, check out our FAQ page or Contact us! Want more ideas for your custom screens or sliding screen doors? Read our blog! Metro Screenworks offers two high-quality varieties of copper screen: Brite Bronze Screen and PURE Copper Screen. To better serve you and the variety of uses for copper screen, we offer this screening material in various roll sizes and lengths. We can also provide cut pieces of our Brite Bronze Screen. To learn more about the copper screen that we provide, contact us! Want to look at it before you order, request a sample. If you are looking for copper screen that provides strength, durability, and elegant charm, our Brite Bronze Screen is a perfect choice. Not only does it provide all the durability and corrosion-resistant qualities that has come to be expected with copper screen, but it weathers to a dark bronze color that looks beautiful with a variety of aesthetics including vintage and coastal homes. Because our Brite Bronze copper screen does not oxidize like aluminum screening, it is the ideal choice for coastal areas and inland regions. Pure copper screen is as beautiful as it is functional and it is as close to pure copper as mesh comes. It can be used on your window screens, screen doors, and porch panels. It can be used to construct RFI shielding, Faraday cages, decorative elements, and more. If you are looking for a more cost-effective option, our Brite Bronze Copper Screen is a great option that works just as well as copper screen, depending on the purpose of your screen. What Are Faraday Cages & RFI Shielding? The Faraday cage or RFI shielding was invented by the Michael Faraday in 1836 and is still an effective way to protect people and electronic instruments from electrical fields outside the cage or shielding. Because of the high conductive properties of copper, the outer electrical source is canceled out, causing whatever is inside the cage to be unaffected by the outer electrical charge and radio frequency interference (RFI). Faraday cages can be used in a variety of applications. You probably use one in your kitchen everyday — your microwave! Your microwave appliance heats your food using microwaves. However, microwaves are extremely dangerous and the Faraday cage in your microwave protects you, keeping the microwaves in your appliance. Faraday cages are also used by electricians for protection as they work on various tasks, during an MRI, for EMI shielding, and as lightning safety. Copper mesh is exactly what it sounds like: it is a screening material that is made either entirely or partly from copper and is copper-colored when first installed until it patinas to a elegant bronze color. This screening material has a lot of uses including installation as insect screen in windows and screen doors for pest control. Because of copper’s composition, copper screen is ductile, malleable, and also possess the qualities of high thermal and electrical conductivity. It also does not oxidize like aluminum screening. Copper screen has become a popular material to screen renovated and coastal homes and historic buildings in addition to a variety of other uses. Additionally, our copper screen coordinates seamlessly with copper architectural accents such as roofing, dormers, and gutters and works well in screen doors, windows, and porches. If you are ready to install a material that will provide a subtle elegance to your home, hotel, or business and will keep insect pests out, install copper screen. Shop Metro Screenworks’ full inventory of copper online. To learn more about copper screen and the benefits it could provide you, read more below. Copper is a material that has been used in construction as well as other uses for thousands of years. 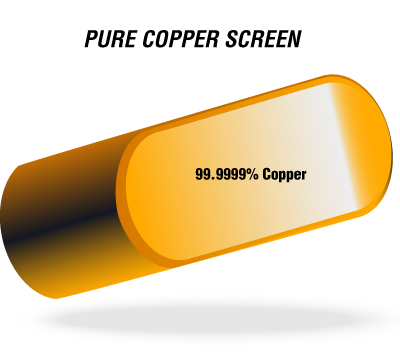 Because of its resistance to corrosion, high thermal and electrical conductivity, copper screen has been used in many applications. Those applications include insect screen, pest control fumigation, decorative elements robotic and power automation, health industry, bookbinding, and even robotics and power automation. Why Install It in Your Window Screens and Screen Doors? Though there are a ton of uses for copper screen besides window screens, the question that you’re probably asking is “why should you install it in your window screens and screen doors?” You may be especially curious as to why you should install it in your screens when you could install traditional fiberglass or aluminum screen. To answer this question concisely, you should install it for aesthetic reasons, as well as for its resistance to oxidation. One of the reasons why you bought your vintage home was probably because of its aesthetics. Older homes are appealing because they are all unique. Yes, they may reflect design elements of a particular era, but they all have their own characteristics and unique charm. We recommend installing copper screen in your window screens, screen doors, and screened-in porch panels as it best compliments the look of most historic homes with a nostalgic, elegant look. Though you could install insect screen that is normally used in mass-produced box homes, why not install copper screen? Copper screen provides the same benefits as any other screen, (i.e. keeps the eight- and six-legged pests, tree leaves, the occasional loose plastic bag blowing in the wind) however, it does so by with elegance while complimenting the aesthetics of your one-of-a-kind, timeless home. Copper screen when it is first installed is a bright, beautiful copper color. It ages to a subtle bronze patina. To prove our point, many historical structures are screened with copper screen because it doesn’t distract from the styling of the buildings themselves and the first screens used were actually made out of copper! Copper isn’t just another screen with a “pretty face”; copper screen is extremely resistant to oxidation, particularly the corrosive properties of salt air and brine making it an excellent choice for coastal buildings and homes. If you live near the coast, you most likely understand how corrosive salt water and the surrounding atmosphere can be. Everything near the coast seems to rust more easily and faster than those in other environments. Screens that are repeatedly exposed to salt spray and the salty air tend to rust and break down a lot sooner than those that are made from elements like copper. Why Doesn’t Copper Break Down? First, we need to look at why other metals seem to rust faster than copper. Without getting too technical, salt water causes the electrons in metal to move more easily than when metal is in fresh water. Also, because salt water makes for a good conductor, it is a catalyst for a variety of different chemical reactions — and a catalyst for rust production. Copper and zinc are resistant to rust and instead produce a beautiful patina and maintain their structural integrity when they come in contact with salt water. Copper and zinc, which is a component of our Brite Bronze screens, actually reverses the process of corrosion and instead produces iron which is what appears as the bronze-colored patina on your screen or other copper materials. Because copper screen increases the longevity of your window screens and screen doors in coastal conditions, you save money by installing copper screens in your home, hotel, business, and other structures. Though initially installing copper screen may be a bit more of an investment when compared to installing traditional screen materials, copper screen will easily and quickly prove to be a worthwhile investment. Copper screen is very malleable, making it easy to install in your window screens, screen doors, and screened-in porch panels. To give you options, Metro Screenworks offers copper screen in screen rolls in various lengths, sizes, and types to provide you the options you need to complete your screening projects. Still have questions about copper screen and how it can serve your project, contact us! Our window screen experts would love to help you get the materials you need. Metro Screenworks is online screen store owned and operated out of Denver, Colorado. We not only offer high-quality window screen products at affordable prices, but we offer custom screening options. Your window screens can do so much more for you than just keep the bugs out. Your screens can up your energy efficiency of your home when you install solar screen. You can enjoy all the benefits of fresh air without pollution and allergies when you install air filtration screens. Metro Screenworks been serving homeowners, contractors, business owners, and others since 1979 with the custom screen solutions that you need to make your house a home and your business function at it’s best. Want to learn more about window screens, the health benefits of fresh air, and more? Read the Metro Screenworks blog! We post regularly about topics that are relevant to window screens, screen doors, home improvement projects, and more. Read recent posts below or search our blog archives for specific topics. Also have you checked out our YouTube channel yet? Check out our channel to get tips for measuring your windows for a new screen and more!